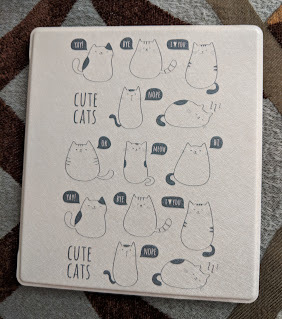 Musings of a Bookish Kitty: Weekly Mews: My New Kindle & April TBR Poll Winner! 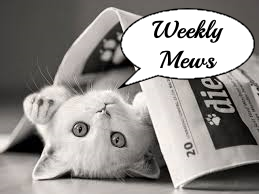 Weekly Mews: My New Kindle & April TBR Poll Winner! Today will be a busy day for us--lots of running around. I am looking forward to a lazy day tomorrow. Hopefully I can do some of that catching up on my blog (and commenting) that I keep saying I will do. It has been a crazy few weeks with no end yet in sight. My mom got home safely and her surgery yesterday went well from all reports. I couldn't be there for her, but the waiting room was full of family and friends who could. She is home now and resting. We should hear from the doctor in a few days. From what I heard this morning from my brother, my mom is already up and trying to do things around her house. She isn't one to stay down for long--even when she should be resting! Thanks again for all your prayers and kind thoughts! My back is still giving me a bit of trouble. I mostly am having to be careful with how I bend and how much I carry. I made the mistake last night of loading the laundry basket up too much with clean clothes and then carrying it up the stairs. It made for a rough night and little sleep. My Oasis arrived in the mail early this week! I haven't actually used it yet, other than to set it up. I want to start with the "right" book. It's more compact than I imagined it to be, but I love the feel of it in my hands. I think I am going to like it quite a bit! 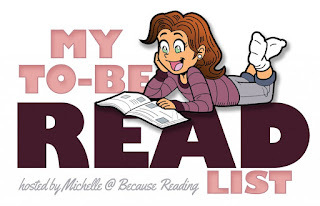 What I Am Reading: I really struggled early in the week with what to read next (too many choices!). I kept going with Les Misérables and War and Peace as a result. That isn't a bad thing, of course, but I don't want to get too far ahead. I am really enjoying both now, so it is not hard to do. I started on Jean Johnson's Dawn of the Flame Sea and am now nearly done with it. I do not know what I expected, but it wasn't what I got. The jury is still out on this one. The book got off to an interesting start though. It is lagging right now though, so I hope something happens soon to pick things up. What I Am Watching: I am caught up with The Walking Dead, but will likely not get to see the season finale until later next week (I do not watch television live very often). I missed all of last season of Fear of the Walking Dead, but do plan to watch the third season anyway. If only for Morgan. I also have been watching Timeless, which I kind of like, but am still on the fence about--just as I have been since the show first aired. Why do I keep watching, you ask? It has everything to do with the history aspect. I am not at all thrilled about the current turn of events in the show though. It was a close race, but it looks like The Girl From the Savoy by Hazel Gaynor won with 12 votes to The Girl Who Came Home's 11 votes. 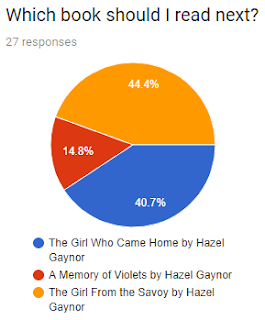 A Memory of Violets only received 4 votes in the end. 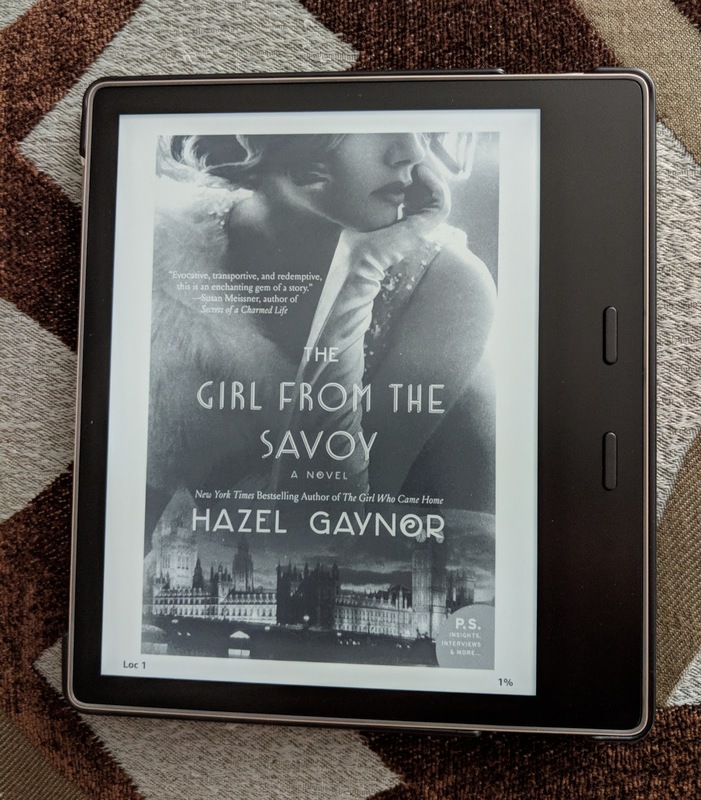 I am really excited to be jumping into a Hazel Gaynor novel, and look forward to reading The Girl From the Savoy. It does sound good! Thank you to all who voted in this month's poll! 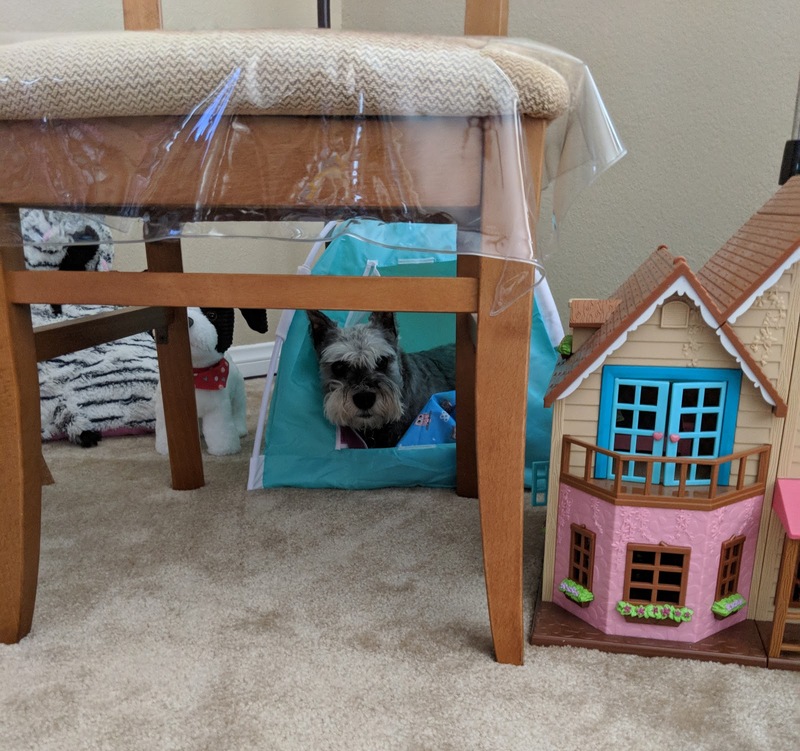 What is good for a doll and a cat is good for a dog (my mom's) too. That kindle cover is adorable! Glad your mom is doing well so far! And hope your back feels better too! I'm really curious about Fear the Walking Dead this season too, with Morgan joining. I hope it's good! Greg - Thank you! My mom is doing well. She had company staying over with her the first few nights to help, but has been on her own the last couple. I am curious to see how Fear of the Walking Dead is. Hopefully it won't matter that I didn't see any of last season to get into this new one. I'm glad to hear your mom's surgery went so well! Take care of your back - it'll take a while for that to heal up. 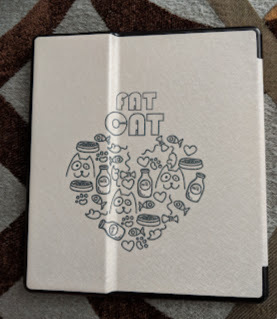 I love the cover of your new Kindle! Kathy - Thank you! Back pain is just that, isn't it? A pain. Just when I think it's doing better, it proves me wrong. Maree - Thank you! I really like the cover too. :-) I haven't yet started The Girl From the Savoy, but need to soon! Glad to hear your moms surgery went well and she is already moving about too. Love the Oasis cover! Hope you have a great week! Jenea - Thank you! I hope you have a good week as well! Glad your mom is doing alright and I hope that your back gets better. Ronyell - Thank you! I hope so too! Jenclair - I thought it the cover was fitting. :-) My mom is doing very well. She's in good spirits and seems to be healing well so far. Enjoy your new device. It's so convenient to read books online, especially when I'm traveling. Deb - Yes, it is a very convenient way to read! The Oasis cover is so adorable! And I'm glad to hear your mom's surgery went well - hope your back gets better next! Eustacia - Thank you! I couldn't resist the cover when I saw it. My back is mostly better, but I could probably do better at resting it. Sarah - My husband and daughter suggested I name my Oasis Cosette after Les Miserables, and so Cosette it is. :-) You are probably right. My body does take on stress in physical pain sometimes. I wouldn't be surprised it some of my pain can be attributed to that. Thank you so much for the well wishes. Trin Carl - And now I've seen the season finale of The Walking Dead so I can stop avoiding spoilers. :-) I have been wanting to see Station 49, but didn't get a chance. Did you like it? I hope you enjoyed your vacation! Glad your mom is doing well and resting now. Enjoy the new e-reader and I can't wait to watch The Walking Dead tonight. Hope your back feels better also. My step-dad is actually having back surgery next month. Naida - Thank you! I am really liking my new e-reader so far. What did you think of The Walking Dead season finale? I hope your stepdad's back surgery goes well! I hope it doesn't come to that for me. I hear the recovery time can be quite long. That cover is so cute! My daughter would love it. I can't remember which one I voted for but I hope you enjoy it. Can't wait to see what you think. Michelle - My daughter likes the cover too. :-) I need to start on the winner tonight! I was trying to finish another book that was dragging for me. Ugh. Thanks for visiting! Sending good thoughts for your mom. I do love the idea of the Oasis...but I also hope my Paperwhite (Pippa)continues to work for a lot longer. I hate to change what is working! I love the cover of The Girl from the Savoy. Enjoy! Laurel-Rain - Thank you so much for your good thoughts for my mom. I understand your not wanting to change what is working in regards to e-readers! If I hadn't needed to replace mine, I probably would have stuck to my Paperwhite too. Woo-hoo my vote won! Looks really good. I hope you enjoy it. I'm so glad to hear your mom's surgery went well and she's already feeling like she can move around. I'm the same way - I don't like staying resting any longer than I have to. Sounds like you're the same way too! Take care of that back! I forget - were you going to a chiropractor or masseuse to take care of it? I have a masseuse I see every two weeks, otherwise I'd be hobbling around all the time. I really think they should be covered by insurance, it's part of caring for your body!! Yes, I may have inherited my mother's inability to rest for long. Even when I'm so sick I have to stay home from work, I usually manage to get the laundry or something done around the house. I just can't help it. LOL I don't see a chiropractor or a masseuse, but either might be worth checking into. Glad your Mom is doing well. I love the cover for your Oasis. I love mine. Hope the week ahead is good for all! Kim - Thank you! I am glad she is doing well too. I am glad to hear you like your Oasis. I like mine so far too! That's good news, so far, about your mom. Glad to hear that. Your Oasis cover is unbelievably cute! I don't know if I'd open it to read it I had one like that, I'd just keep staring at it :D hahah. 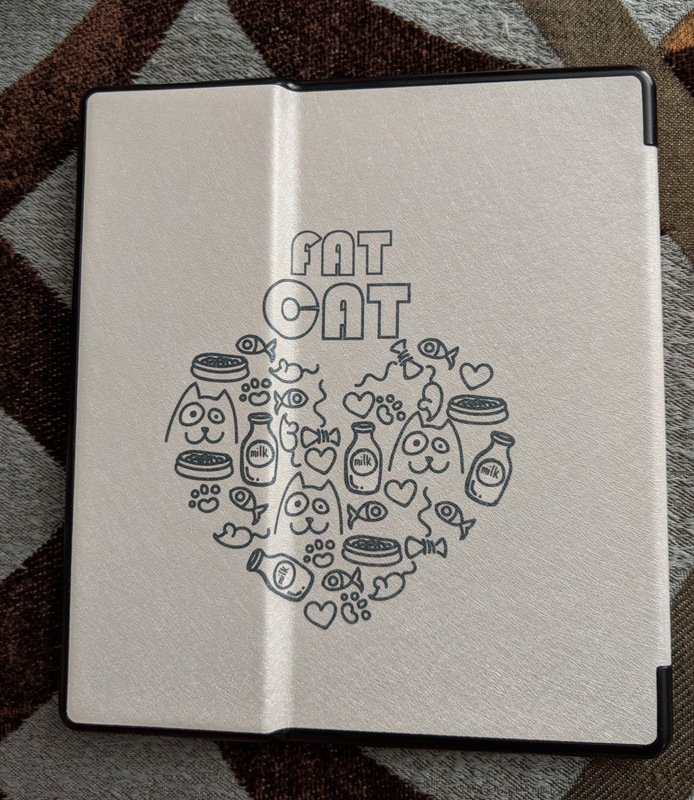 I love the Kindle cover. I am glad the surgery went well and your mom is home and getting around. Ellen - Isn't it adorable? I couldn't resist. I am relieved the surgery went well too! Glad your Kindle got there and I love the look of it and the cover. So very pleased that your Mom's surgery went well. Will keep her in my prayers. Wendy, take care of yourself. I know it's tough when life is so busy. Backs are tricky aren't they? Hope you guys have a really good week! Kay - And it came early! Thank you for your continued prayers. And thank you for the reminder. I had a little melt down yesterday--everything just hitting me all at once. My cat got extra cuddles as a result. Yeay for the new kindle! Fingers crossed your back behaves itself and you have less trouble with it this week. You know, I didn't know the Oasis was square either. I actually pictured it as being a little bigger too. My husband said the dimensions are right there in the description, but I completely missed that. Haha It's a good size though, and I'm enjoying it. Stephanie Jane - Isn't it great? I couldn't resist it when I saw it. Melody - Thank you! My mom is such a trooper. She is doing well. First off, I hope your mom recovers from surgery quickly. So sorry to hear about your back. Mine goes out every now and then which causes all kinds of problems for me. I know it's basically because I am so out of shape. I need to lose at least 50 pounds. Ti - Thank you! She seems to be doing well. I have had back trouble for a while now too. And like for you, it comes and goes. I am sure my being out of shape has something to do with it as well . . .
That is wonderful that your mom's surgery went well, hoping for a speedy recovery. Oh my goodness, the Kindle cover is so cute. Hopefully you'll feel back to normal soon, take it easy and try not to over do it. 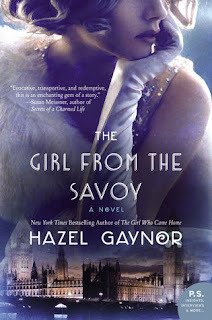 I really like the cover for The Girl From the Savoy, enjoy it. Have a great day. Jovita - Thank you for the well wishes for my mom. And for my sake. My back is still giving me some trouble, but not as much. I made my husband carry down the laundry the other day but I should have waited for him to carry it up . . . I just can't leave things be. I'm glad to hear your mom made it through surgery okay. I hope that her recovery goes smoothly. OMG, the cover for your Oasis is the cutest! I'm going to have to show that to my sister, who is a huge cat lover. I hope you have a great week and that your back doesn't give you anymore trouble. Suzanne - Thank you! So far her recovery seems to be going well. She just needs to take it easier. I couldn't resist that cover when I saw it. :-) It usually takes me a while to decide on one, but not this time! I am so happy to hear that your mom is doing well. I hope she continues to improve and beat her illness. Ouch! Your poor back...I hope it feels better soon :) I love my Oasis but I still don't have a cover for it. I hope you like yours as much as I do. Have a great week! Anna - I love the cover of Gaynor's book as well. My mom is always up and doing something. :-) She's doing well, thanks for thinking of her. So happy to hear your mom's surgery went well and I love her spirit to get back into the swing of things so soon. Just remind her to take it easy :) Hope you are enjoying your Oasis. Looks great!